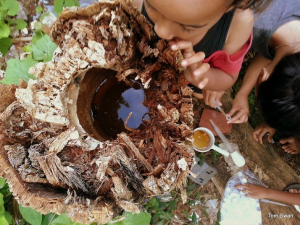 Tongan children looking at mosquito larvae. Ground-breaking research by University of Canterbury masters student Tom Swan is helping Tonga’s Ministry of Health in the fight against mosquito-related diseases. Mosquitoes are a significant pest and carrier of malaria and dengue fever diseases around the world. Malaria alone contributes to around one million fatalities each year. Malaria is not present throughout Tonga but dengue fever is known to cause significant illness and death each year. Supervised by Professor Jon Harding, Swan’s research helped identify mosquito larvae which will greatly aid their Ministry of Health. He won a prize for his annual Showcase postgraduate presentation at the University of Canterbury. An increase in public awareness, reduction of larval habitats and the production of a pictorial identification key are major outcomes from the research, says Swan, a former Scots College student from Wellington. Dengue fever and the chikungunya virus cause fevers, muscle pain and severe joint inflammation. These diseases are particularly fatal for the elderly and young. Mosquito habitats form in warm stagnant water. Artificial habitats such as car tyres and water containers and natural habitats like pools and ponds are the most common. Late last year we visited 88 sites throughout the main island of Tongatapu and offshore Eua’ Island. Larvae dippers and pipettes were used to collect mosquito larvae at each site. Euthanised mosquito larvae were preserved in ethanol and transported back to New Zealand for further identification under a compound microscope. Nine species of mosquitoes were recorded in Tonga, including the virulent Asian tiger mosquito, only the second known occurrence of this mosquito in Tonga. The Asian tiger mosquito has spread swiftly throughout the tropics and is a significant carrier for dengue fever and chikungunya virus. It is a veracious feeder and notorious for outcompeting established mosquitoes. This may be primarily due to its ability to feed during the day, while most established mosquitoes feed primarily at dawn and dusk. A recent outbreak of chikungunya virus in April 2014 infected 10,000 Tongan residents, resulting in numerous fatalities. Car tyres were the most common habitat from which mosquito larvae were collected. Initial assessment has shown that the Asian tiger mosquito appears to be outcompeting many of the established mosquitoes. This is of growing concern for the people of Tonga and may increase the presence of such mosquito-borne diseases in Tonga in the future. Educating the Tongan people about these diseases and the prevention of habitat - mainly removal of car tyres) was a key component of the research with involvement at Tonga High School, the Atenisi Institute and the Tongan Ministry of Health,’’ Swan says. The University of Canterbury has been aiding Tongan high schools by installing solar panels to help reduce expensive diesel-fuelled power bills. Over the last six years Canterbury students have provided solar power in six Tongan high schools.